A vegan Christmas dinner is easy to prepare and just as delicious as any turkey feast – provided you have the right recipes. Take a look at our comprehensive menu and create plant-based perfection. Veganism has never been as popular as it is right now – and it’s set to keep on growing. Most restaurant menus now include vegan dishes and Christmas shouldn’t be any different. Rather than hoping you or your vegan family members will be satisfied with a plate full of roasted vegetables while everyone else tucks into turkey, make this Christmas a vegan-friendly banquet with our incredible menu. First things first, you want to serve up a nice selection of canapés that prove vegan food can be just as varied and full of flavour as its meat- and dairy-filled counterparts. 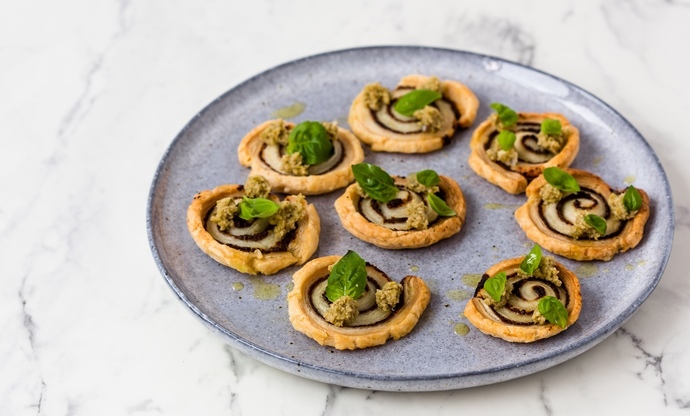 Pollyanna Coupland’s wild mushroom palmiers are beautiful little things, made with ready-made vegan puff pastry and topped with a punchy green olive and truffle tapenade. Victoria Glass serves up a crowdpleasing plate of spiced vegan sausage rolls which are guaranteed to go down a storm, while Nancy Anne Harbord’s silken tofu aioli is the perfect dip for all manner of crudités. Once everyone’s appetites are suitably whetted, move into the dining room and let the vegan feast begin! 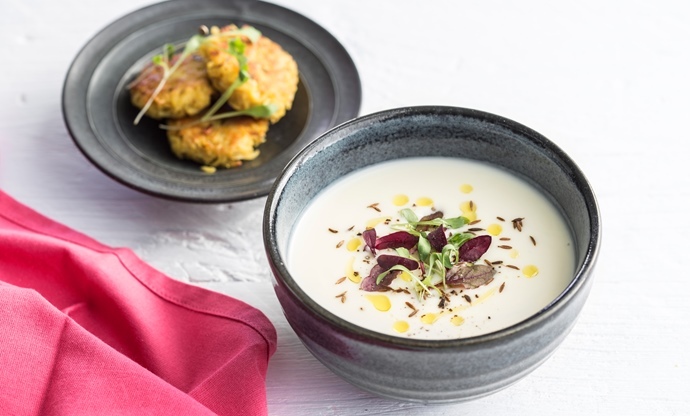 To start, why not opt for a classic winter soup, given an exotic touch thanks to coconut milk and spiced parsnip bhajis on the side. For something lighter, try a fennel and orange quinoa salad (which can easily be prepared a day in advance) or go super-festive with a mushroom and chestnut pâté, complete with fermented cranberries and a few leaves of tarragon. Put vegetables in the spotlight for your main course – non-vegans might grumble at first, but a few forkfuls of any of these dishes will soon change their minds. 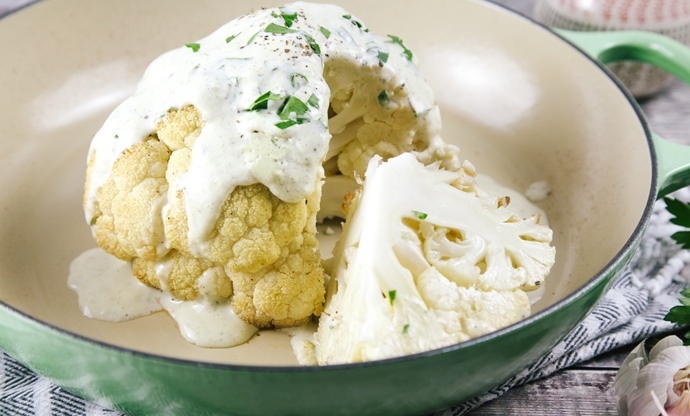 A whole roast cauliflower always looks impressive on the table, and Aimee Ryan’s version comes complete with a (dairy-free) creamy, herby sauce. Her vegetable strudel, on the other hand, encases finely chopped vegetables in a vegan pastry, to be served Wellington-style at the table. Karen Burns-Booth’s pithivier follow a similar route, but incorporates chestnuts and tofu as well. Once you’ve wooed everyone with your vegan main, it’s time to make room for pudding. 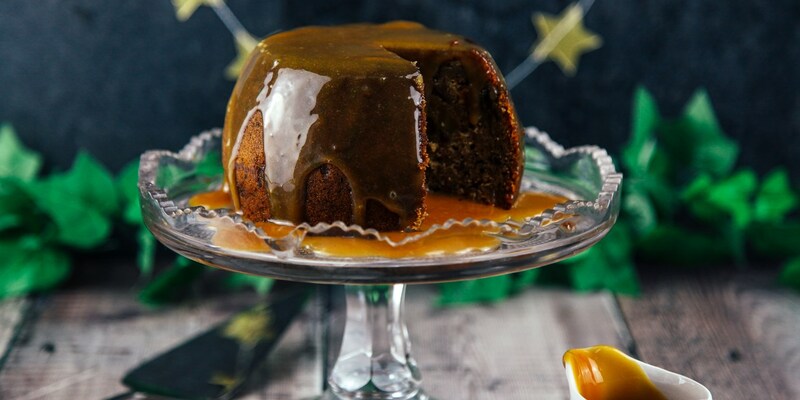 While there are plenty of vegan Christmas puddings for sale in the shops, if you’re anything like the vast majority of the UK then you’ll secretly want something a bit different. 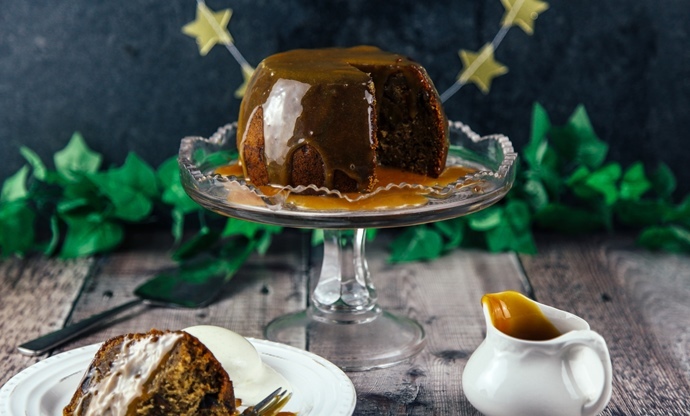 A gingerbread sticky toffee pudding looks just as grand and has a wonderful toffee sauce to drizzle on top, while vegan chocolate and prune brownies are always going to go down a treat. And for something seriously comforting, a vegan rice pudding complete with festive spice will lull everyone into a relaxed slumber in front of the TV.